Even if you have already upgraded your home to resist fire by installing a new roof, windows, or deck, it is important to maintain those home components in their proper condition so embers cannot gain entrance to the home. Creating defensible space by clearning flammable vegetation and debris is also crucial to reducing your wildfire risk. For more information on the performance of building materials in a wildfire, please see http://firecenter.berkeley.edu/ or www.extension.org/surviving_wildfire. For more on creation of defensible space, contact your local fire agency. during a wildfire. Photo by Steve Quarles. The Coast Redwood Forests in a Changing California Science Symposium was held June 21-23, 2011 at UC Santa Cruz with just under 300 registrants in attendance. 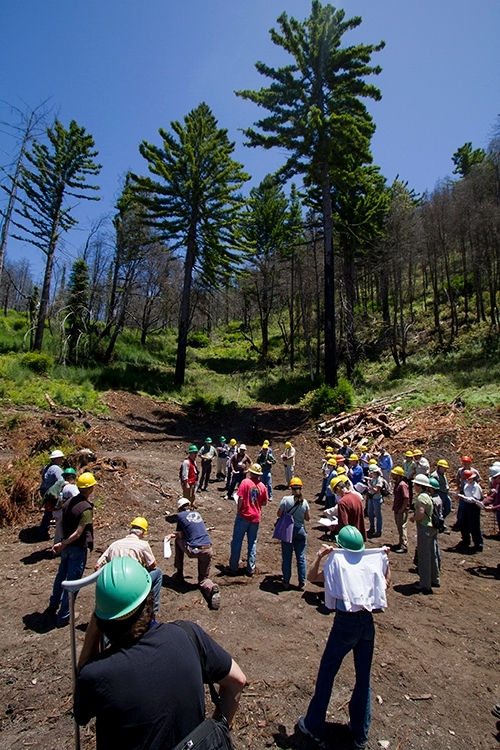 Participants ranged in background from graduate level students to university forestry faculty, land managers, and conservation groups, public agencies, and land trust members. 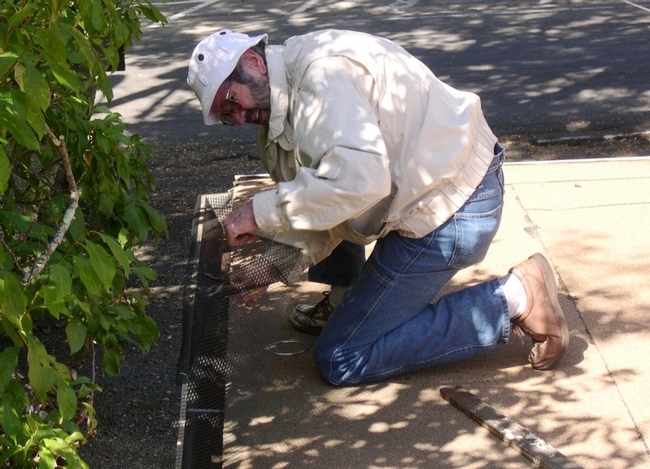 The symposium was strategically held in Santa Cruz, near the Southern end of the redwood region. Designed to present the state of our knowledge about California’s coast redwood forest ecosystems and sustainable management practices, this symposium was built on earlier redwood science symposia held in Arcata, CA in June, 1996 and in Santa Rosa, CA in March, 2004. Seed funding for the Symposium was from the University of California/California State University competitive grant program. Rick Standiford of UC Berkeley, Doug Piirto of Cal Poly San Luis Obispo, and John Stuart of Humboldt State Univeristy served as the three co-chairs of the symposium. Standiford, Richard B.; Weller, Theodore J.; Piirto, Douglas D.; Stuart, John D, technical coordinators. 2012. Proceedings of coast redwood forests in a changing California: A symposium for scientists and managers. Gen. Tech. Rep. PSW-GTR-238. Albany, CA: Pacific Southwest Research Station, Forest Service, U.S. Department of Agriculture. 626 p.
The first day of the symposium consisted of two simultaneous field tours, one to the North County and one to the South County. The North County tour focused on active redwood timber management on corporate ownerships operating under the unique policies that dictate decision making on the central coast, and Cal-Poly’s forest management and research at its Swanton Pacific Ranch. It also included, a brief tour of the Big Creek Lumber Company sawmill and a visit to areas burned in the more than 7,000 acre Lockheed Fire of 2009. The South County tour traversed the range of redwood forest conditions from the old growth of Henry Cowell State Park and the uncut 120 year old young growth of Nisene Marks State Park to uneven-aged young growth stands established by individual tree selection harvesting on non-industrial forestlands. Opening remarks started the second day of the symposium and began the academic concurrent sessions. Local historian Sandy Lydon spoke about the special history of the redwoods in the region, recounting stories from his boyhood about roaming through the forests and giving a brief synopsis of the settlement of the area. Steve Sillett, Humboldt State University forestry professor, described his experiences climbing the redwoods and his discoveries in the redwood forest canopy ecosystems, as well as his findings on tree growth from dendrochronology measurements. Ruskin Hartley, Executive Director and Secretary of Save the Redwoods League, called on the audience to set “audacious goals and collaborative actions.” He maintained that nature does not develop boundaries and that in moving forward, we should focus on a shared set of goals and that public and private land should progress simultaneously. Concluding the session, Ron Jarvis, Home Depot’s VP of sustainability talked candidly about the role of environmental sustainability practices and policies as part of the home improvement retailer’s business model. He noted that when he began in the sustainability department he undertook a two year long project to understand where every sliver of wood from over 9,000 products originated to ensure sustainable wood practices. Over 75 concurrent oral presentations were showcased over two days, pertaining to the topics of: Ecology (15 presentations); Silviculture and Restoration (11 presentations); Watershed and Physical Processes (22 presentations); Wildlife, Fisheries, Aquatic Ecology (10 presentations); Forest Health (10 presentations); Economics and Policy (6 presentations); Monitoring (7 presentations). 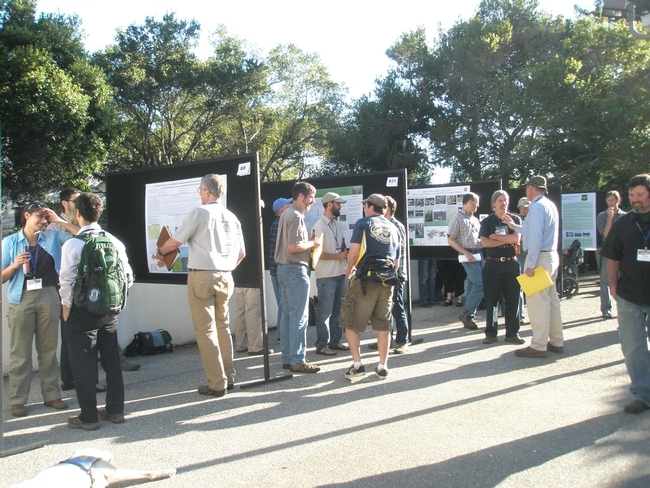 In addition, almost 40 posters were displayed during the evening reception, ranging in topic from post-fire response, to long-term watershed research, and community forestry models. Held outside on the warm Santa Cruz evening, participants enjoyed a strolling dinner and networking with colleagues, making the reception a highlight of the symposium. Participants strolling through the evening poster reception. The symposium concluded with closing remarks about the future of research in the redwood region from John Helms, UC Berkeley and Mike Liquori, Sound Watershed. 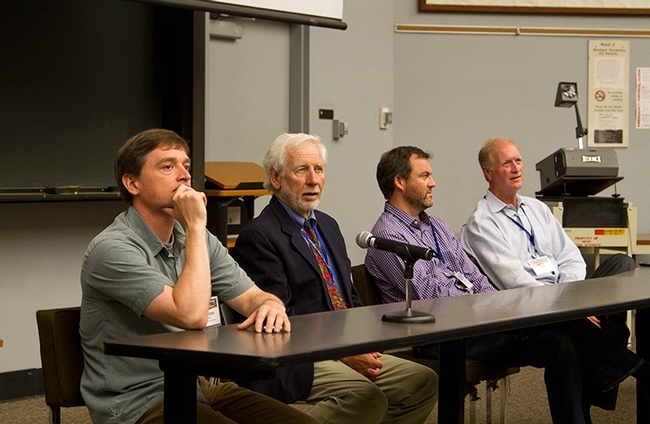 In addition, a panel including Dan Porter, the Nature Conservancy, Lowell Diller, Green Diamond, and Kevin O’Hara, UC Berkeley discussed the interface of research, management, and conservation. The overall discussion led to the conclusion that academic research and applied research should be made available to the field as a whole as findings progress and that more opportunities for networking and interactions should be made available to the forestry community. Overall, the symposium fulfilled its purpose to identify key knowledge gaps, bring together multi-disciplinary teams, and help identify future opportunities for collaboration. Participants were pleased with the presenters and research shown. Many noted that a highlight of the symposium was being able to meet and interact with others whose works they had previously cited in their own research. Of the approximately one half of participants who completed the follow-up survey, 100% hoped to see more events like the 2011 Redwood Symposium. Last week I visited Trinity River Lumber (TRL), a sawmill, in Weaverville, California. The sawmill was almost totally destroyed by a fire in September 2009 and completed rebuilding in January this year. The mill is the largest private employer in Trinity County with approximately 115 full time jobs. The community was relieved that TRL’s owner chose to rebuild the mill after the fire. The new mill is impressive in its versatility to saw a range of products and in its use of technology to maximize production. Both the pony (small log) and main headrig saws make use of 3D scanners to optimize lumber yield from each log. They are currently increasing production to approximately 120,000,000 board feet of lumber per year. The main products are green (undried) douglas fir and white fir dimension lumber. Headrig log deck – the yellow bar is part of the 3D log scanning system that outputs to the screen on the right. TRL is classed as a SBA (Small Business Administration) sawmill by the Forest Service. This means that they are eligible to bid on Forest Service SBA set-aside sales (http://www.sba.gov/content/natural-resources-assistance-program). There are only four SBA sawmills left in California: TRL, Shasta Green, Sierra Forest Products and Sound Stud (currently curtailed). TRL do not own timberland and source logs, from public and private lands, within a 200 mile radius. Some logs sourced from the Sierra Nevada are delivered on flat bed trucks with log stakes so that the same truck can then take finished lumber to market. As part of the UC Woody Biomass Utilization program (http://ucanr.org/sites/WoodyBiomass) I have worked with TRL on a number of projects including deploying new technology at the mill that increases the efficiency of sawing small logs. Most recently I worked with the mill to help them secure a 2011 Forest Service Woody Biomass Utilization (WBU) Grant. The grant of $250,000 was one of three awarded to California applicants (http://ucanr.org/blogs/blogcore/postdetail.cfm?postnum=5184) and will help pay towards the engineering required for a biomass fired boiler to run dry kilns with the potential to add electrical generation in the future. The project will allow TRL to produce kiln-dried lumber, increase the efficient use of sawmill residues and create a new market for woody biomass in the county. Since 2008 the UC Woody Biomass Utilization program has helped capture almost $5m dollars for California businesses, non-profits and government though the WBU grant program. This represents a significant investment in helping the forest products industry in California retool for smaller logs and woody biomass from ecological restoration projects. We have helped many businesses like TRL, non –profits and others with understanding technology, markets and sourcing grants – perhaps you could be next? The Northern California Prescribed Fire Council provides continuing education opportunities for those using fire in forest management and conservation activities. Although prescribed fire councils are common in the U.S., this is the first such council in California. Council participants include public and private resource managers, researchers, firefighters, fire safe councils, tribes and regulatory agencies. The council hopes that by working together, this diverse group can increase individual members’ expertise in using fire for resource management and can improve fire-related education in the state. The council aims for a better public understanding of the value of prescribed burning in the state’s fire adapted landscapes, for increased safety in the use of prescribed fire, and for increased delivery of fire-related knowledge to land managers throughout the state. The Northern California Prescribed Fire Council works collaboratively to improve techniques, increase training opportunities, and ameliorate permitting and other regulatory hurdles. Join us at the fall meeting of the Northern California Prescribed Fire Council in November in Humboldt. 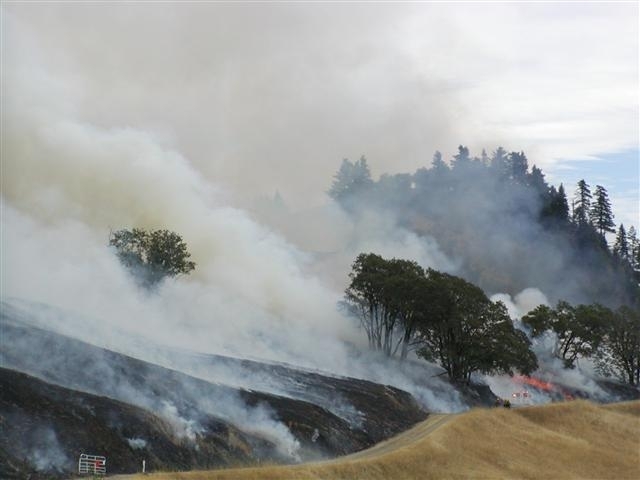 Click here for more information on the Northern California Prescribed Fire Council. Recently three leaders from the Taiwan Forestry Research Institute (TFRI), a division of Tawain’s Council of Agriculture (COA), traveled to Northern California to meet with UCCE foresters to gain information about our outreach program that they might be able to apply in Taiwan. 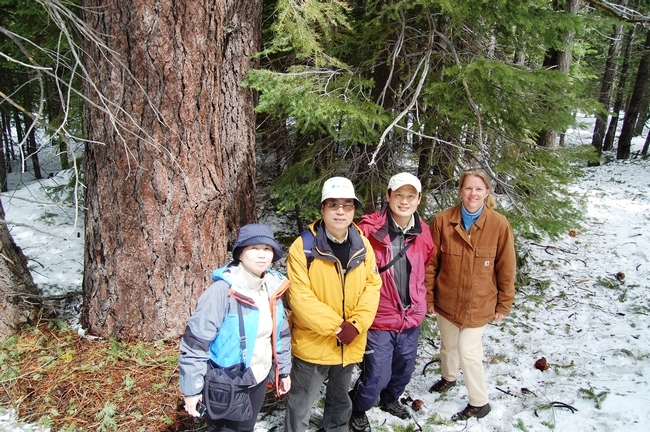 Dr. Yue-Hsing “Star” Huang, Director of TFRI; Dr. Meng-Ling Wu, Department Chief of Forest Protection; Dr. Gene-Sheng Tung, Assistant Researcher in the Department of Forest Protection spent three days at UC Berkeley, UC Berkeley’s Blodgett Forest Research Station, South Lake Tahoe, and in Quincy and Plumas Counties exploring extension projects and learning how UCCE Foresters initiate and maintain relationships with landowners, managers, conservation groups, and policy makers. TFRI is composed of 6 research centers across Taiwan and employs over 120 scientists and over 200 staff and technicians. Taiwan has rich ecosystems in a tropical climate, with over 55% of their island covered by forests. TFRI is specifically focused in conducting research on new management practices, sustainable forestry, consulting, and operating several example forests and botanical gardens. 99.8% of Taiwan’s timber is currently imported because of the country’s strict management policies, so TFRI is particularly focused on successful management techniques to harvest their own timber and boost their economy. In addition, with over 50,000 species in Taiwan, TFRI is interested in researching biology and has an impressive database of species, as well as a forest tree seed bank. The scientists and researchers at TFRI are aware of the need to not only focus on research, but also develop an extension program that would allow them to share their research and educate others. While in Berkeley, the visitors from TFRI had an opportunity to meet with UCCE Forest Pathology Specialist Matteo Garbelotto, and learned about forestry issues from forestry specialists Rick Standiford and Bill Stewart. They also learned about funding and administration of research and extension from the Dean of the College of Natural Resources, Keith Gilless. Standiford and Stewart showed the three TFRI scientists about the Center for Forestry’s Blodgett Forest Research Station in Eldorado County, looking at long-term research databases, the philosophy of research forest administration, as well as specific programs on forest health, fuel reduction, and alternative silvicultural regimes. Field visits had a special emphasis on the altered fire regime in the Sierra Nevada and how the University of California’s research and extension arms are working together to address this pressing issue. 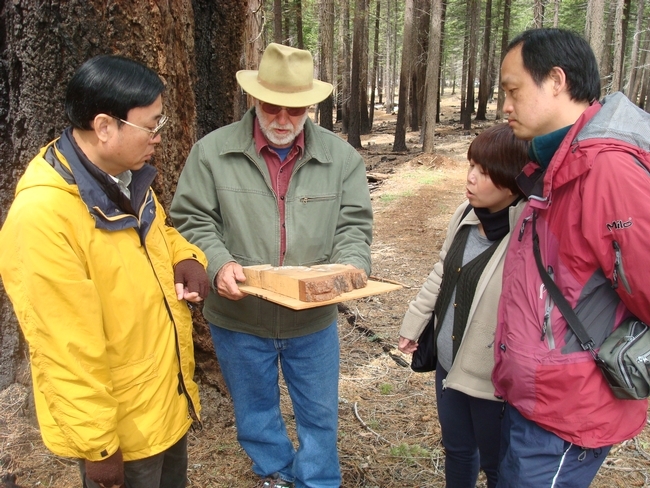 In South Lake Tahoe, CE Forest Advisor Susie Kocher hosted the Taiwanese foresters. They discussed how forest science and forest policy interact with staff at the Tahoe Conservancy, visited the 2007 Angora fire, and visited forest fuels reduction projects. They seemed to particularly enjoy seeing the ample snow in the high country. Dr. Meng-Ling Wu, Dr. Yue-Hsing "Star" Huang, Dr. Gene-Sheng Tung, Susie Kocher enjoy the snow in South Lake Tahoe. While in Plumas County the visiting foresters examined community fuel reduction projects conducted by the Plumas County Fire Safe Council that have been monitored by Cooperative Extension Advisor Mike De Lasaux. They were also given a tour of the Sierra Pacific Industries mill in Quincy. Dr. Yue-Hsing "Star" Huang, Dr. Meng-Ling Wu, Dr. Gene-Sheng Tung get a hands on lesson while on their Plumas County project tour. We are hopeful that this visit will enhance the collaboration between California forest research and extension programs and Taiwanese forest scientists.